USS Arizona (BB-39) burning after the Japanese attack. A Nakajima B5N level bomber dropped a Type 99 Number 80 Mark 5 1,760 pound (800 kilogram) modified 16-inch (406 mm) naval shell that penetrated near Arizona's Number Two turret and caused the forward ammunition magazine to explode. The projectile was rated to penetrate 5.9 inches (150 mm) of armor plate. The exact sequence of the explosion has never been determined; Arizona burned for days. Note 5 inch/25 caliber antiaircraft guns along the superstructure, pointed skyward. Lieutenant Commander (later Rear Admiral) Samuel G. Fuqua (October 15, 1899 – January 27, 1987) stated in Arizona's After Action Report, "I was in the ward room eating breakfast about 0755 when a short signal on the ship's air raid alarm was made. I immediately went to the phone and called the officer of the deck to sound general quarters and then shortly thereafter ran up to the starboard side of the quarter deck to see if he had received word. On coming out of the ward room hatch on the port side, I saw a Japanese plane go by, the machine guns firing, at an altitude of about 100 feet. 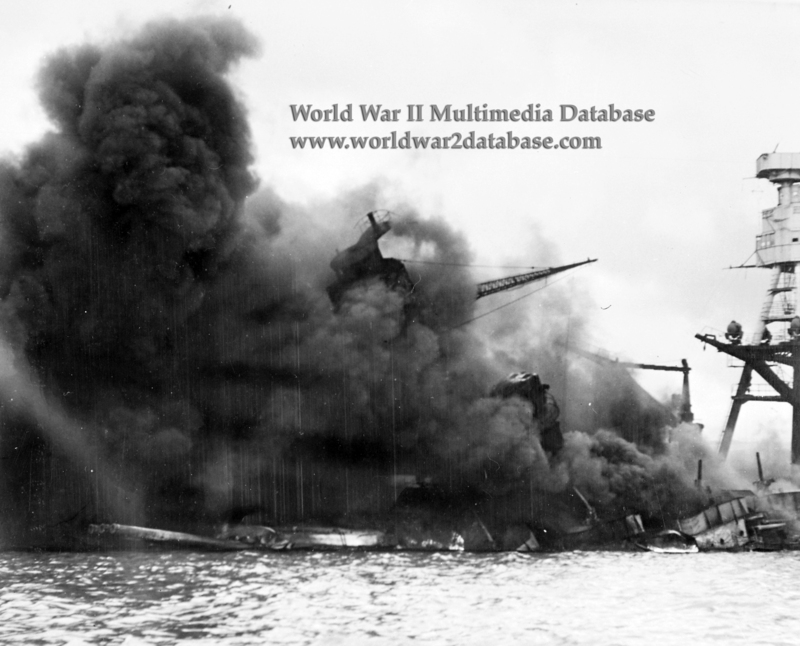 As I was running forward on the starboard side of the quarter deck, approximately by the starboard gangway, I was apparently knocked out by the blast of a bomb, which I learned later had struck the face plate of Number Four turret on the starboard side and had glanced off and gone through the deck just forward on the captain's hatch, penetrating the decks and exploding on the third deck. When I came to and got up off the deck the ship was a mass of flames amidships on the boat deck and the deck aft was awash to about frame 90. The antiaircraft battery and machine guns apparently were still firing at this time. Some of the Arizona boats had pulled clear of the oil and were lying off the stern."